Google Cancels Town Hall After Employee's Controversial Diversity Memo : The Two-Way The meeting had been called to discuss fallout from the memo written by a senior software engineer who complained that "biological causes" explained why women were underrepresented at the tech giant. Google CEO Sundar Pichai delivers the keynote address of the Google I/O conference, in May. 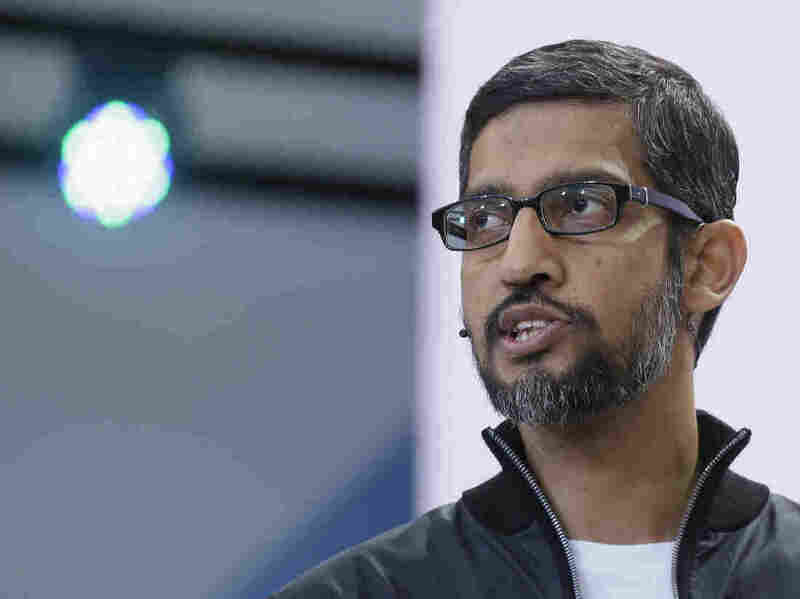 Google CEO Sundar Pichai cancelled a company-wide Town Hall that had been organized after an employee was fired for writing a memo that criticized the tech-giant's diversity efforts. In an email to employees, Pichai said some questions that had been pre-submitted via Google's moderating software "appeared externally this afternoon and on some websites Googlers are now being named personally." "Googlers are writing in, concerned about their safety and worried they may be 'outed' publicly for asking a question in the Town Hall," Pichai wrote in the email, which was confirmed by NPR's Laura Sydell. James Damore, a senior software engineer at Google, was fired after authoring a 3,300-word document that was shared across the company's internal networks. In the memo, Damore said that "biological causes" are part of the reason women are underrepresented in tech departments and senior management positions. He criticized Google for being an "ideological echo chamber" that made it hard to dissent from the company's "left bias" and "politically correct monoculture." The memo caused a backlash and Damore was subsequently fired for violating the company's code of conduct, which Pichai says prohibits "advancing harmful gender stereotypes in our workplace." In his email on Thursday, Pichai said he had had the chance to meet with many employees. "The vast majority of you are very supportive of our decision. A smaller percentage of you wish we would do more," he wrote. "And some are worried that you cannot speak out at work freely. All of your voices and opinions matter ... and I want to hear them."